PITTSBURGH & CHICAGO--(BUSINESS WIRE)--Nov. 15, 2018-- Today, JELL-O PLAYTM introduces the first edible slime launched by a major brand. 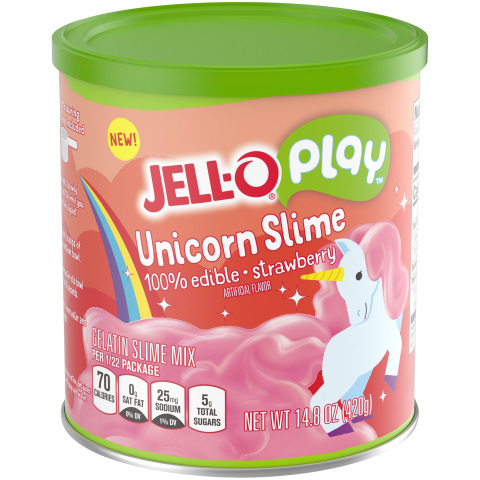 The slime, which comes in strawberry-flavored Unicorn and lime-flavored Monster varieties, is JELL-O’s first launch since the brand announced its new line of JELL-O PLAY edible toys in June. The edible slime launch comes on the heels of JELL-O’s summer launch of JELL-O PLAY, a new line of edible JELL-O gelatin products designed to inspire families to engage in free play and fun. The three JELL-O PLAY product lines can be molded, shaped, and built into whatever parents and kids can imagine, and are designed around themes that spark creativity, such as Ocean and Jungle. All items are available online and in national retailers, and have a suggested retail price under $5. Now, the JELL-O Play platform includes slime, adding an edible twist to one of the hottest trends in toys and furthering the brand’s mission to inspire families to engage in creative play. The colorful, edible and imaginative DIY slime experience is easy to make: simply add water to the pre-made mix to create slime that will drip, stretch, and conform to any shape families can imagine. Each canister of JELL-O PLAY Edible Slime makes two batches of slime, is 100% edible, and washes away easily with soap and warm water. JELL-O PLAY Edible Slime is now available for pre-order on Amazon.com with a suggested retail price of $9.99. The slime will be available in select retailers in December. Join the conversation with #JELLOSLIME and by following @JELLOPlay on Instagram, Facebook and Twitter. 3 Edible Slime recipes on Pinterestand YouTube. Springboard is a new platform from The Kraft Heinz Company dedicated to nurturing, scaling, and accelerating growth of emergent, disruptive US brands within the food and beverage space. The Springboard platform is seeking opportunities to develop brands with authentic propositions and inspired founders within one of four pillars that are shaping the future of the food and beverage space: Natural & Organic, Specialty & Craft, Health & Performance and Experiential brands. For more information, visit www.springboardbrands.com. © 2019 The Kraft Heinz Company. All rights reserved.